Mestre Moa do Katendê, Romualdo Rosário da Costa, 63 years old, was stabbed in the back, 12 times in total, after an argument with Paulo Sérgio Ferreira de Santana, 36, at a bar near his house, on the night of the Presidential (and local) elections in Brazil. It is said that an argument started when Moa do Katendê said he voted for PT, while Paulo was a Bolsonaro supporter. After the argument, Paulo allegedly left and returned around 20 minutes later to ‘Bar do João’, in Dique Pequeno – Salvador, with a knife, stabbing not only Moa, but also his cousin, Germinio do Amor Divino Pereira, 51 – in his right arm. Germinio has survived the attack. Paulo then ran away from the bar, but was caught by the police who followed a trail of his blood (he had cut his finger during the attack) to his house, where he was found hiding in the bathroom. According to the police he had packed a bag and intended on running away. Paulo said had been living in the area for two months and was having a discussion with the bar owner when Moa and his cousin became involved. things we fought hard for. You are young, you don’t know how much I had to fight to get to this point. Moa was buried on the 8th of October 2018. Around 500 people attended his funeral. 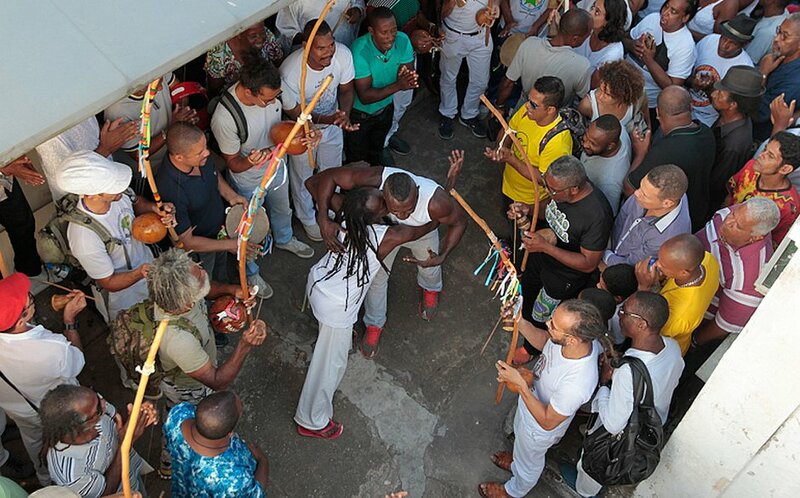 Friends and relatives said their goodbyes with music and capoeira. Moa was a reference of our culture. He founded Afoxé Badauê in 1978 and contributed a lot with Ilê and to all the black community. Interview with the accused, Paulo Sérgio Ferreira de Santana. He says Moa called him ‘black and gay’… Let’s just for one second go with this (very unlikely though, given Moa’s level of consciousness and enlightenment) – even if that was true, how does it justify Paulo going home to get a knife and stab Moa to death???? Paulo denies the murder was politically motivated. It was certainly premeditated, it was certainly murder. He could have just gone home and stayed there. Moa made the world a better place, he will not be forgotten. ← MAIOR É DEUS, GRANDE É JOÃO! I have added this link to my blog Leticia. Thank you. want to share your blog here? Please feel free to do so.